The proceeds raised from a book written on the Irish language revival in the North of Ireland have been donated to Irish Medium Education charity TACA. Feargal Mac Ionnrachtaigh, who works for Irish language development agency Forbairt Feirste, is the author of the book, ‘Language, Resistance and Revival- Republican Prisoners and the Irish Language in the north if Ireland, which charts the story of role of republican prisoners in the Irish language community revival. ‘As a product of the Irish medium education sector in Belfast, I know how important organisations like TACA are in providing financial support to our emerging nursery schools who receive no state support. Therefore, I thought it was only fitting that any modest funds raised from the book, which aims to tell the story of bottom-up language revival in the north, should be directed back into the development of the sector. “We’re are very grateful to Feargal for raising this money but would stress that you don’t have to write a book to support the Irish language through TACA!! 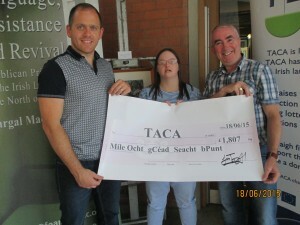 “You could sign up to the monthly donation scheme through the homepage of the TACA website (www.taca.ie), help selling scratch cards or the door-to-door collections in your area. If any schools, nurseries, afterschool groups or GAA clubs are organising sponsored events in conjunction with TACA we can claim the gift aid back for them which is a hefty 25% added to what they have already raised”. Rinneadh airgead ár bailíodh ón leabhar a scríobhadh ar athbheochan na Gaeilge ó thuaidh a bhronnadh ar an charthanacht Ghaeloideachais,TACA. Is é Feargal Mac Ionnrachtaigh, a oibríonn leis an aisíntacht forbartha teanga, Forbairt Feirste, atá mar údar ar an leabhair, ‘Language, Resistance and Revival- Republican Prisoners and the Irish Language in the north if Ireland, a insíonn an scéal fán ról a d’imir príosúnaigh phoblachtánacha san athbheochan pobail. ‘Mar dhéantús don earnáil Ghaelscolaíochta i mBéal Feirste, tuigim cé chomh tábhachtach agus atá eagraíochtaí cosúil le TACA a thugann tacaíocht airgeadais do naíscoleanna i mBéal Forbartha nach bhfaigheann aon tacaíocht stáit. Shíl mé go raibh sé oiriúnach, mar sin de, aon mionairgead a bhailigh an leabhair, a insíonn scéal pobalbhunaithe na hathbheochana Gaelaí ó thuaidh, a threorú ar ais isteach san earnáil. ‘Ainneoin is go dtéann airgead ó gach leabhair a cheannaítear, bíodh sin in siopa leabhair ná arlíne, i dtreo TACA, eascraíonn an deonachán seo go díreach ón chamchuairt leabhair a rinne mé in 2013-14. Rinneadh timpeall 30 lainseálacha san iomlán, le seoltaí agus leachtaí ar fud na 6 chontae agus timpeall na tíre ar fad: bhí mé i mBaile Átha Cliath, Corcaigh, Ciarraí, Gaillimh, Tír Chonaill agusl labhair mé go hidirnáisiúnta fosta in Learpholl, Glaschú, Oslo, Nua Eabhrac agus Bostún. ‘Tá muid iontach buíoch d’Fheargal as an t-airgead seo a bhailiú ach b’fhiú go mór a ra nach gá leabhar a scríobh chun tacaíocht a léiriú don Ghaelilge fríd TACA! !